Is Swanage Town Council again to allow the hot dog/burger trailer to occupy the seafront area (once the wet weather shelter)? Is this put out to tender? Can anyone apply to run a business there? Under the banner of 'improving recycling' (goodo) Purbeck District Council has decided to scrap weekly rubbish collections, and instead go for making everyone in Purbeck have wheelie bins, with fortnightly waste collections. The theory seems to be that this will focus people's minds on recycling more (to meet government targets- hurrah). But what about those people who have nowhere to keep a wheelie bin, and would have to leave it on the street or in front yards or gardens? What's that going to make our towns and villages look like? Does anyone care ? And what if you are at all frail? What if you would have to drag a wheelie bin through your house? What about holiday lets, who won't want to drag bins around? Just because this plan is 'A ' solution doesn' t mean it's the RIGHT solution, does it? And a fortnight's accumulated kitchen waste! Oh, and it's going to cost everyone more - more than £3 on the average council tax. dc.gov.uk Alternatively, a Recycle Helpline phone number is available on 01929 557279. I've been living in Swanage since July with my family. Everyone thought I was a grockle until November, always getting looks in shops. Hearing comments about grockles and wishing them gone from locals is always unsettling, I would imagine even more so if you are one. Now settled I'm fed up with hearing moans about how dead the town is in winter. It's a myth, I know because I see many walkers and climbers and daytrippers all the time, I used to be one, weekends are always buzzing. I say get over yourselves, and sell the town in winter. Shutting shops for a couple of months, whats that all about? Grockles are your livelihood, be nice to them. On answering the telephone you will hear a recorded message congratulating you on winning an all expenses paid trip to an exotic location. You will then be asked to press 9 to hear further details. If you press 9 you will be connected to a premium rate number that costs approximately £20 per minute. (Even if you disconnect immediately after pressing 9, it will remain connected for a minimum of 5 minutes, costing you around £100.). HANG UP ON ANY UNSOLICITED "FREE OFFER" CALLS. Who rules Britain? The Countryside alliance? The huntsmen, or the democratically elected MPs? Simple, no nonsense choice. Who rules Britain? Democracy? or Feudalism. The landowners? The huntsmen, or the person you elected? If you decide that the hunting fraternity rules Britain? Then all that we fought and suffered for in the way of universal suffrage, is lost. Nothing to do with politics, it is a simple choice. Obey the law, or create chaos and anarchy, a chaos, that once started, could spread to others with an axe to grind, possibly, without bounds. If red coated men and women on horses can ignore the law, then they set a precedence for a thousand other discontents! Think about it! For therein lies a breakdown of society as we know it. There are many laws I loathe and detest, but I obey them. We fought against a dictatorial way of life, Are we “The British People” to allow others to circumvent the law, or the “Spirit of the law” that was enacted on a “Free” vote in ‘our’ Parliament and by our democratically elected MPs? Irrespective of their colour, or their party? Today the 14th of February in our garden, we have a young, newly fledged blackbird being fed by two parents. That means they must have nested around Christmas. No mistake, the young bird still has the yellowish side to its beak, typical of newly fledged birds. On 11Feb we were given the latest...18 wooden groynes..sand recharge from dredging of Poole Harbour. So at least wooden groynes will satisfy many who were against rock. But high cost..£3.5 million, with PDC having to pay around £450,000 (us, through levy on Council Tax). But still something seems not right (to me, at least). I thought most questions were deflected with evasive answers, such as ... oh, I'm sure they would have considered that point....and that one ... and people may have local knowledge, but we've had consultants study it ...and let's not re-visit the 'take away the banjo jetty' issue (why not?). One question that I don't think has been asked is how feasible it would be to REPAIR the exisiting groynes. And a number of people thought that the sea would take away any sand brought in (and might dump it back the following week). It may be that many people prefer wooden groynes to rock, if we have to something. But do we REALLY need anything on this scale? What about an ongoing schedule of maintenance, of the existing groynes, and of any damage that may occur to the seawall? Why on earth is the seafront not closed to traffic all year around? There can be no excuse, as the road out through the Wareham forest makes our main road look like a dirt track, All over Dorset, we find decent metalled roads, but here? It is like going back in time. A positive disgrace. Who is responsible for this terrible state of affairs? What is of interest, is to find out how many visitors there are to this site? Is it a valid means of communication with the local population? Or is it confined to just a few who are interested in computers? 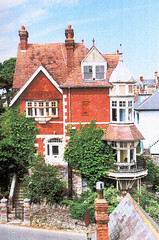 A high proportion of Central Swanage is to be redeveloped. Plans were proposed some time ago for the former Silver Fish Grill and the adjacent building. These prompted Peter Hayman to look at redeveloping his bakery building in Commercial road. The Kings Bar is to be torn down and now there is a proposal to build houses on Queensbury Contractors builders yard in Kings Road East. No doubt other Commercial Road freeholders will want to beuild flats before long. This all means that a high proportion of the centres employment land will become residential. This is the biggest change to the town centre since World War 2 and as faraas I can tell both town and district councils are blissfully unaware of the total scale of the changes. can any one tell me what a traffic warden looks like? I am told there are some here? never seen one myself. After the moan about disabled parking; its time for a giggle. The seaside town in Autumn, the saddest place on Earth. Flower baskets with dead plants, all lacking former grace. Shiny rain swept streets, with muddy leaf choked gutters. Here and there an old coffee carton, adding to the clutter. The shop awnings noisy flapping, in the West wind gale. White plastic bags that tumble, along the beachside trail. On the shelf a left over gift, a heart, a silver copy chain. Summers gone, now the gales, will drive across the land. No kiddies play on golden sand, no anxious parents call. The painful teenage heartaches of summer, tearfully gone away. See the dry Autumn leaves drifting, was all this just yesterday? Let us all be thankful! the Grockles have all gone home at last. The position of the disabled parking places in the town become more farcical as time goes by, The places outside Barclays Bank for example are just about a silly a place to put them as could be imagined, with the big lorries trying to get round the back of the shops to unload. Then we have folk parking there, and unloading their gear for a day on the beach. Decorators wagons. Builders lorries. You name it! Some time ago a law was passed that made the fraudulent use of disabled parking places liable to a new fine. The law has been enacted, and is in operation in Scotland, soon to come in here., What is different about it? Nothing much really, except it is now a £1000.00 fine for fraud of a parking place. It seems in Scotland now, no one pinches the disabled parking places. 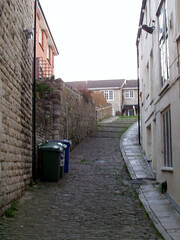 I suppose the Council spent thousands laying cobbles to make this ancient lane more attractive. Do you think having wheelie bins permamently in the lane enhances the appearance at all? 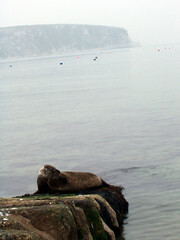 For those who aren't already aware, there has been a seal hanging out by the stone quay since Sunday...still there today, Friday 4 February. There is a real chance that much-valued schools may be forced to close, so please find out more, and act NOW. Please act NOW, so that you don't miss the deadline. Your chance to change things around Swanage! less litter … better traffic management … the Council should listen to locals more… more affordable housing … a multi-purpose leisure centre … improved parking … more things for young people … sort out the Mowlem … more visible policing … fewer run-down shops..
As part of the process of preparing a Community Plan for Swanage and the surrounding district, many volunteers have worked hard to find out the issues that concern people most. But now it’s time to make things happen. It’s time to decide which things are most important, and how to turn ideas into reality. There is help available. And some money, too. The Swanage Town & Community Partnership is holding informal working meetings to agree the next steps forward. There will be two evening meetings at the Purbeck House Hotel and one Saturday afternoon meeting at the Mowlem committee room. You don’t have to be an expert. Anyone can contribute, as long as you are prepared to speak up and discuss possibilities. Everyone’s contribution is needed to help create community projects that will benefit all of us. You can just turn up on the day, but it would be a great help if you can say in advance if you plan to join us: please call Roger Seaman on 554667. At Council meeting on 31st Jan, the Mayor mentioned that someone who had vandalised a shelter had been identified by the police from the CCTV footage — and found guilty on 12 Jan (12 months conditional discharge and payment of costs)... perhaps worth publicising that the cameras do work. (Mayor also noted that an extra camera is being installed shortly).